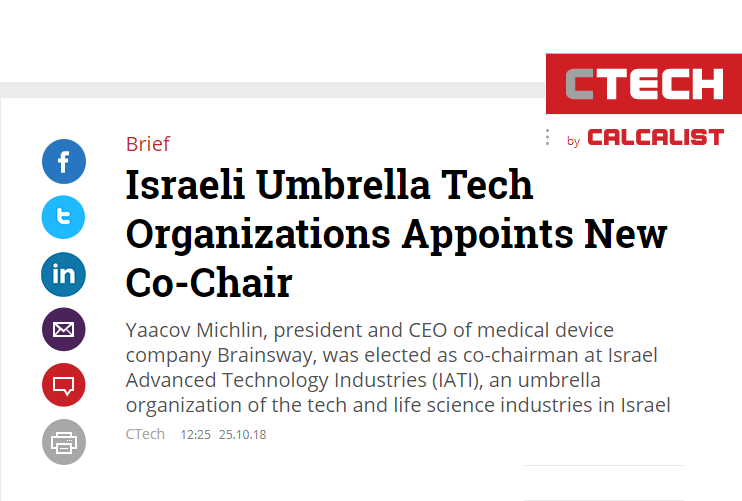 IATI Proudly welcomes its newly elected Board of Directors and Co-Chairs: Business Wire, Globes, Calcalist, Calcalist (English), Associated Press, Yedatech, Block Tribune. Benzinga, People and Computers. Karin's interview with Minister of Economy and Industry Mr. Eli Cohen, Erez Tsur's opinion piece, Yossi Matias's article, Karin's opinion piece. Click for the online version of the whole book (Flash required). Over 100 CEOs at IATI's Annual MNC Forum Meeting - PC.Co.Il. Globes & IATI's project of Israel's most promising 2018 startup: "Globes" names Puls Israel's most promising 2018 startup, Ehud Barak speaks at Globes Most Promising Startups event ..
Karin's special opinion piece in Globes - the print version. A Globes interview about a conference on cannabis legalization in Canada (an event which IATI co-organized).